When it comes to tranquil and secluded accommodation in the Cederberg, the Cedar Rock Reserve offers the purest experience available. Located on the valley floor of the Cederberg Mountains, Gemsbok chalet offers unmatched, panoramic views of the mountain ranges and the surrounding blankets of seasonal flora that guests travel to this area to enjoy and photograph. Cape mountain zebra, gemsbok and many other indigenous inhabitants roam the open plains virtually unhindered by human interference, and guests frequently stop to stare out of their cottage windows in delight at the passing of a grazing antelope. In terms of Cederberg accommodation, Gemsbok Chalet has two bedrooms with four beds in total, making it the perfect retreat for good friends or a smaller family unit. 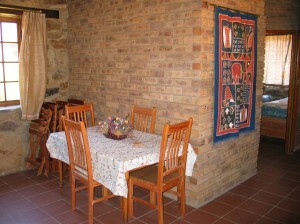 Unlike the more isolated chalets of Leopard Rock and Eagle Chalet, this unit is in close proximity to Zebra chalet. For those travelling in a group this can mean the perfect arrangement, as privacy is still available yet a short walk down the trail will see you to your neighbour’s porch for sundowners. It’s important to note that although every essential comfort is provided in Gemsbok such as a gas fridge, gas water heater, shower and more. These facilities were carefully selected so as not to detract from the natural environment created within the restored stone cottages. Nothing will distract you from your solitary observations of the Cederberg environment as you hike the mountains, steer your bicycle down the fynbos surrounded roadways, or simply enjoy a picnic under the African sky. The surrounding Khoisan rock art is another major source of interest to local and international visitors and has been dated to be as old as 28 000 years. The Cederberg is host to such art works which vary greatly in age from between 8000 years back to as recent as 100 years – offering guests a rare insight into the progression of human creativity, motivation and every day struggle. 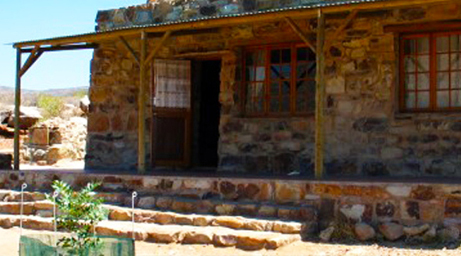 For an unrivalled experience in natural accommodation in the Cederberg, Cedar Rock offers the complete package.